Exterior lighting should not only enhance the beauty of your home, but it should also add safety and security. Exterior lighting can make a striking first impression. Adding lighting to landscaping elements can create a dramatic look and beautify and accentuate your home. 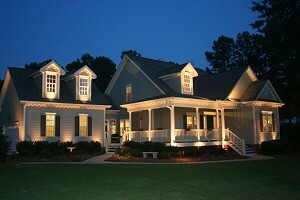 Choosing fixtures to light walkways and porches can provide both ambient and safety lighting. Exterior flood lights allow activities such as sports or gardening to extend well into the evening. Lamp posts and low voltage pathway lights create atmosphere around your home. Swimming Pools and hot tubs can provide hours of backyard fun and are becoming more common with homeowners today. Electricity for water features must be carefully installed to ensure safety and prevent electrical hazards. Lighting around your pool or hot tub will create ambiance and ensure the safety of your outdoor water environment. Other water features such as outdoor fountains and ponds can also enhance your home.